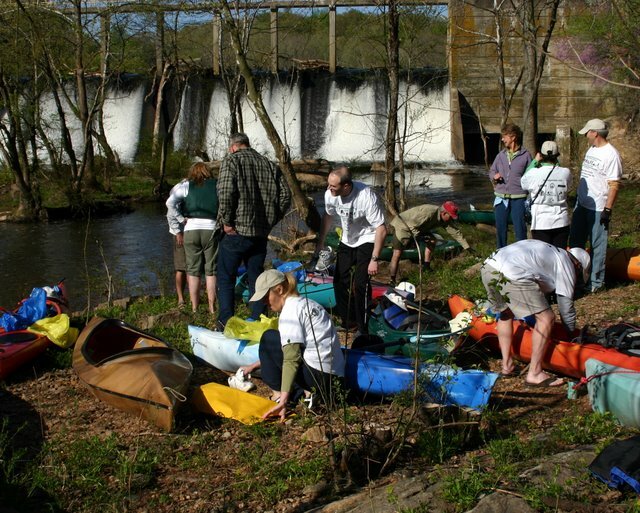 On Saturday, April 9th, from 9 AM to 4 PM, several local non-profit groups and agencies are teaming up to sponsor a clean-up of a 14-mile stretch of the Occoquan River, from below the Lake Jackson Dam to the Lake Ridge Marina, and they are looking for your help! The Prince William Trails and Streams Coalition (www.pwtsc.org), Prince William County Park Authority, Public Works, the Prince William Soil and Water Conservation District, the Occoquan Watertrail League (OWL) (www.owlva.org ) and The Friends of the Occoquan (www.friendsoftheoccoquan.org) and several bordering Homeowners Associations are working together on this exciting project. REI, (Recreational Equipment, Inc.) an outdoor retail co-op is assisting with promotion, volunteers, and boats. The Clean-up of the Occoquan River from the Lake Jackson Dam to the Bull Run and Lake Ridge Marinas will be part of the Annual Alice Ferguson Foundation 23rd Potomac River Watershed Clean-up Day (www.fergusonfoundation.org). We are requesting the support of experienced area Canoeists/Kayakers and their organizations to participate in the gathering, and others for off-loading collected debris at Marina and HOA locations identified below. Lake Jackson VFD and Lake Ridge OWL VFD are providing on-water emergency support. Participants will be provided with gloves, trash bags, bottled water and light snacks. Toilet facilities and dumpsters will be available at each site. PWTSC and OWL volunteers will launch canoeists/kayakers on the Prince William County side from below Lake Jackson Dam, Riverview Estates, Occoquan Forest and Canon Bluff HOAs, and the Lake Ridge Marina. The HOAs are providing take-out and put-in points for canoeists and kayakers and for gathered trash drop-off. On the Fairfax County side canoeists/kayakers can use the Bull Run and Fountainhead Marinas. A map of the above cited put-ins and take-outs is linked here. The Prince William County Park Authority and the Northern Virginia Regional Park Authority will provide shuttle service back to participant’s put-in point. Canoeists and Kayakers are requested to register for this event by calling Ed Dandar, PWTSC project officer, at 703-791-6158 or blueways@www.pwtsc.org. Ed is coordinating PWTSC and OWL volunteer locations for put-ins, take-outs, and return transportation. Carpooling is encouraged. Established in 2006, Prince William Trails and Streams Coalition is a non-profit group of passive recreation trail users, dedicated to establishing and promoting a County-wide system of trails and blueways that connect parks with our communities. If you would like to volunteer on other trail work and cleanup days regularly sponsored by PWTSC, please contact us at outreach@www.pwtsc.org, or visit the web site at www.pwtsc.org. From I-95 go north on Rte. 234 and cross the Occoquan Creek Bridge. Make a left turn at 1st red light on to Coles Drive and an immediate left on to Mercury Drive. Make a left turn on Hinson Mill Lane where someone will help you find parking in the general area. From Rte. 28 go south on Rte. 234 passing the Brentsville Road Exit and Traffic Light and turning right at the next Traffic Light on to Coles Drive and then left on to Mercury Drive. If you miss the Coles Drive turn, make next right turn before the Bridge on to Hinson Mill Lane where someone will help you find parking in the general area. Car-pooling is encouraged because parking is limited on Mercury Drive and between the Outdoor Furniture and Backyard Shed & Deck. Parking is available off of Coles Rd on the shoulder of Collinreid Ct.
From I-95 take Prince William Parkway towards Manassas; at the Hoadly Road/Davis Ford Road traffic light intersection, turn right on to Davis Ford Road and proceed to first traffic light, turn right on to Bacon Race Road and proceed 1.5 miles to Stop Sign, turn left on to Wolf Shoals Road, make 2d Left turn on to Observer Lane into Cul-de-Sac. Entry to Park Gate will be seen and you can drive down to launch point. After unloading equipment, individuals can park up in the Cul-de-Sac area. Car-pooling is encouraged because parking is limited. From Rte.28 in Manassas take Liberia Ave. to Prince William Parkway East. Upon reaching the traffic light at Hoadly Rd. and Davis Ford Rd, make left turn proceed to Bacon Race Road traffic light and turn right. Follow above directions from that point. From I95 take Prince William Parkway towards Manassas, then turn right on to Davis Ford Road, turn left onto River Forest Drive (into Riverview Estates), then turn right at the first street onto Greenway Court. At the end of the cul de sac there is a chain across the road that goes down to the river. Area will be open and you can proceed down to the shoreline. Parking is available in field near the water. From Rte.28 in Manassas take Liberia Ave. to Prince William Parkway East. Upon reaching the traffic light at Hoadly Rd. and Davis Ford Rd, make left turn proceed through the Bacon Race Road traffic light and continue down Davis Ford Rd until you make a left onto River Forest Drive. Follow above directions from that point. From I95 take Prince William Parkway towards Manassas, then turn right on to Davis Ford Road, proceed down Davis Ford and turn right onto Occoquan Forest Drive. Make 2d right onto Split Rail Drive. Go to end of road and through gate area and down to the left to dock area. Unload and park in field on left. From Rte.28 in Manassas take Liberia Ave. to Prince William Parkway East. Upon reaching the traffic light at Hoadly Rd. and Davis Ford Rd, make left turn proceed through the Bacon Race Road traffic light and continue down Davis Ford Rd until you make a right turn onto Occoquan Forest Drive. Follow above directions from that point.